A Library? What is a Library? Jeanne Smith has been a long-time supporter and volunteer of Trees for Life. She and her husband, Herb, have been to Ethiopia many times to share their love of education. Here’s an excerpt she wrote about the importance of education through teaching materials that were donated to Ethiopia Reads by way of Books for Life – an educational branch of Trees for Life. Libraries are treasures for poor children in Ethiopia. Their schools, assuming they attend one, have no books. Most girls and boys have never held a book in their hands. Children learn by reciting after the teacher. 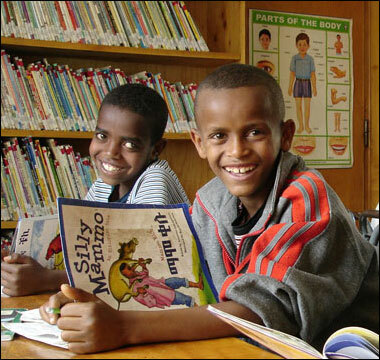 In 2005, Herb and I traveled to Ethiopia to visit the first free children’s library in the country. When all its seats were filled, the large iron gates to the compound clanged shut. Many children remained outside, disappointed. The most heartbreaking scenes I witnessed on my trips to Ethiopia have been young children by the roadside begging for a living. The greatest gift we can offer them is access to knowledge through free libraries and education. Literacy has tremendous power to catapult the poor into a promising future. I commend both Books for Life and Ethiopia Reads for their foresight and compassion. A library revolution brings hope to children in Nicaragua.